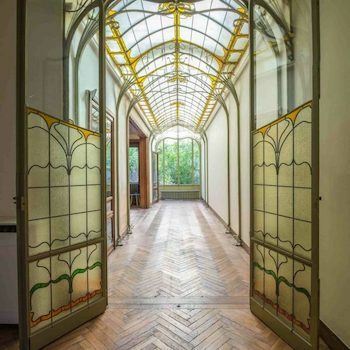 Saturday, April 27, 2019 - 10:45 a.m.
Join the American Club of Brussels for a private, guided tour in English of the Frison-Horta House on Saturday, April 27 at 10:45 a.m.
Victor Horta is the father of Art Nouveau architecture in Belgium. Art Nouveau is famous for its use of natural light, gorgeous cabinetry, organic design and fabulous stairwells. It is a house of nature and light with flora and fauna engulfing the whole house. Recently renovated and open to the public by appointment, it is the only Horta house in the historical city center of Brussels and it is exceptionally the only Horta house that is lived in. It is a living museum, with original furniture, decorative art, murals and frescos. The house is seven meters wide, twenty-two meters deep and about twenty meters high with a monumental staircase, usually considered a subsidiary element, as the focal point. The staircase takes half the area of the house and represents the triumphs of Horta’s cardinal principles. The absolute unity of structure and decor using such ‘unsuitable' materials as concrete and iron to set off marble, stained glass and precious hardwood. The furnishings are doubly related, echoing not only to each other but to the fundamental composition of the house itself and its ornamentation. Please note that this visit is limited to 20 people and is a members-priority event. Non-members may sign up as of April 22. After the visit, those who wish to may join us for a drink or a coffee in the area. Payment in advance to ACB account BE55427919588144 (KREDBEBB). Please mention “Frison Horta House” in the reference section of the bank transfer. Cancellations are possible until noon on Wednesday, April 24. Participants canceling after this time, as well as no-shows, are charged the full cost of the event.